Australia’s largest concentrated photovoltaic (CPV) solar power plant was officially opened this week, with the Victorian energy minister joining executives from the plant’s developer, Solar Systems, to cut the ribbon on the 1.5MW demonstration facility in Mildura. The demonstration of the “dense array” solar technology of parent company Silex Systems is a fore-runner for what is expected to be a 100MW power plant, with construction slated to begin in 2014. Another 1MW demonstration plant is being built in Saudi Arabia, with hopes of further development as that country pushes into the start of a $100 billion solar spending program. The array – whose 40 CPV dishes have been feeding power into the national grid for almost a month, after their successful commissioning began in April – collects sunlight in more than 100 curved mirrors and focuses it onto ultra-high efficiency “mulit-junction” PV cells; technology originally developed by Boeing to power satellites. Silex CEO Michael Goldsworthy says the cells currently boast efficiency rates of around 43 per cent – about double that of today’s best silicon-based cells and up to four times the efficiency of thin film solar cells – but he hopes this can be lifted to more than 50 per cent, or even 60 per cent, with further research. The technology also uses ‘active cooling’ technology to maximise power output while minimising water consumption and prolonging the technology’s lifespan. Last June Silex predicted that the levelised cost of energy (LCOE) for its technology could fall below 10c/kWh ($100/MWh) within a few years – making it cost competitive with a range of technologies such as wind and large-scale solar PV, and below the cost of new gas- and coal-fired generation. 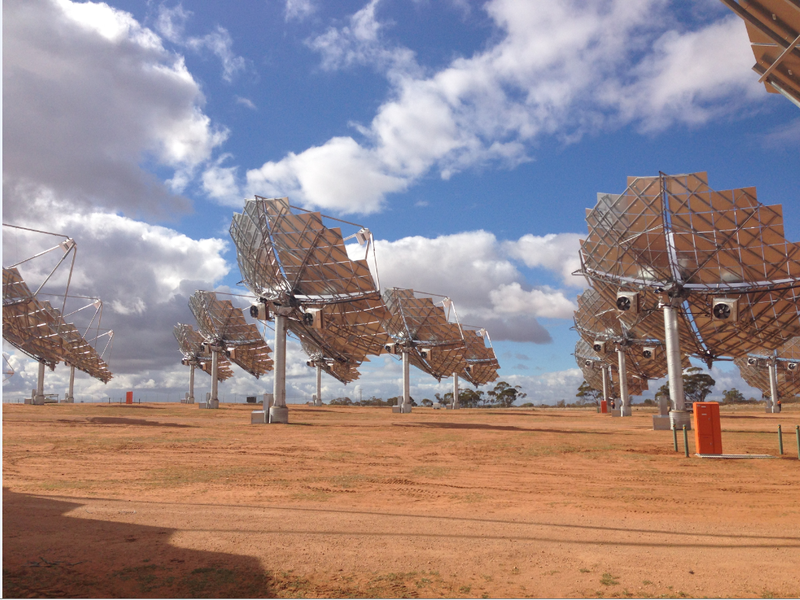 The Australian Energy Technology Assessment (AETA) has since said that this rate, if achieved by Solar Systems’ concentrating solar PV plants, would be one of the most cost-effective forms of future energy production. In its latest publication, Silex cites cost estimates of 6.9c/kWh in a 20MW plant in Arizona by 2020, as the graph below illustrates. “We are very excited about the commercial prospects for this technology, which will potentially provide very low cost electricity from large utility-scale solar power station projects planned for deployment around the world,” Goldsworthy said. He says immediate prospects include plants in the 10 to 50MW stage in Queensland. He says these are in “pre-feasibility” stage but provided no further details. Silex says the 1.5MW Mildura plant generates enough power to feed about 500 homes. If the the company realises its plans to upgrade the plant to 100MW – a move that would require $110 million in additional government grants (the project has already received a $15 million funding package from the Victorian state government, as well as additional federal financial support) – it should then have the capacity to power around 40,000 homes. According to Bloomberg, at 100MW the Mildura plant would be the third-largest CPV facility announced globally, and much bigger than the current largest – a 30MW facility in Colorado. Goldsworthy says the planning phase for the 100MW Mildura Solar Power Station Project continues with construction commencement expected late 2014, subject to successful operation of the demonstration facility and finalisation of funding arrangements. At this stage, there is another $35 million in funds pledged under the Victorian government’s Energy Technology Innovation Strategy Fund (ETIS), and $65 million pledged by the federal government under its Low Emissions Technology Demonstration Fund (now under the Australian Renewable Energy Agency – ARENA).